Computer (Ministers) - (EPT) Excellence Private Training Sign up online today! PaSTOR D sign up today for private training (In-Home). We provide piano, guitar, bass, keyboard sequencing, voice, song writing lessons. Also audio & video production graphic design, website designing and ministry preparation & bible training. Hello Man & Woman of God! Add wise quotes, sermon illustrations,and Bible commentaries, etc. Sermon Building vs. Busy Schedule! and a climaxing "HOOP". WOW! You've made it through another Sunday. Potentially, this often becomes an almost weekly routine of making weekend-based sermon notes. But be aware! Preaching and writing skills are two very different skills. Writing skill is typically developed by people who write frequently, thus making them more communication and grammar conscious. Frankly, how much time have you invested into writing knowledge? Admittedly, we all could use more writing skills. The value of this can truly be appreciated after attending a season of these classes. Blessed by God to self-teach myself so that I may understand further the art of how to teach others. TRULY, teaching is my born passion! Click each photo below to open brochure for more info. God bless you! I humbly pray you understand that my inviting you to work with me for a season isn't presuming you doesn't know how to prepare a sermon. Rather, it’s just to help you realize the potential of your sermons with a bit of private coaching. It will save you a great deal of time considering how busy your ministry itinerary can be along with knowing only a little about the computer. I look forward to assisting you in this regard. Pray about it, call me, and lets get started. Absolutely! The congregation will begin to recognize the difference in your sermon presentation. Lessons are based strictly on using the King James Authorized Bible! 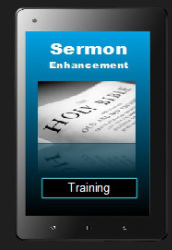 Voice enhancement is available for those of you that desire to include singing along with your ministry in the Word of God. Maybe you just need a vocal tune up to poise you for singing a song before or to climax your preaching. Singing, like all other gifts, can be learned and improved through training. Very often, a minister has not used his or her voice enough to really understand their own voice potential. Come work with me and give it a try! You may stay with me as long as you like. If indeed you are interested in ‘Tune Up” voice training, create a list of songs that you hope to sing. Let us come together and see what we can accomplish for the glory of God and the enhancement of your ministry.